Who We Are - Nicholas Christ Construction, Inc.
Our Nicholas Christ Construction, Inc. Family: Nicholas, Loren, Walter, Win, Tenere and Travis. Nicholas Christ Construction , Inc. was established in 1984. We pride ourselves in custom, quality, green remodeling. We are up to any challenge and do a variety of residential projects from kitchens and baths to large additions. Our company believes in quality, integrity, longevity and sustainability. We are a family of craftsmen who are dedicated to creating a more sustainable world one home at a time. We understand the difficulties that remodeling can place on any family (in fact, we have just remodeled the kitchen in Nicholas Christ's own house). While taking the time to know and to respect our clients and their families, we try to work with the least invasiveness possible. We listen carefully to our clients' desires for their homes and offer creative and sustainable solutions to the challenges that arise in any project. Family is the bottom line, yours and ours. Founded Nicholas Christ Construction, Inc. in 1984. Nicholas graduated from The University of Norte Dame with a Bachelor's degree in English Literature. For two years he studied English Literature in the graduate program at the University of California at Berkeley. Nick has always loved building and in 1972, began working in the trade. He later formed Condon & Christ Construction. In 1984, he founded Nicholas Christ Construction, Inc.
Nick is a highly experienced builder and cabinet maker. He takes pleasure in high quality residential remodeling and Green Building. Nick is also an avid gardener and woodsman. While vacationing in New Hampshire, his happiest days are those spent in the woods. His other hobbies include reading good novels, playing the piano, photography, and bike riding. He enjoys spending time with his wife, Joan and children, Sara and Joel. Walter has 27 years of experience in residential construction including rough and finish carpentry, masonry, cabinetry, stucco, tiling, shingling and plumbing. His hobbies include camping, hiking and spending time with his wife and son. He loves jazz. Walter enjoys working for Nicholas Christ Construction, Inc. because of the sense of caring and respect between crew members and clients. Travis earned a Bachelor of Science in Environmental Conservation with a minor in education from the University of New Hampshire's College of Life Sciences and Agriculture. Travis trained in traditional timber framing techniques with Bullard & Korpi, a design-build company in Sandwich, New Hampshire. Other work experience includes environmental risk assessment of hazardous waste sites in the San Fransisco Bay Area and wildland fire fighting in Oregon. Over the past five years with NCCI he has also worked designing and managing green building projects in the Bahamas. Travis has worked for both the Island School and Cape Eleuthera Institute, teaching ecological design courses and designing and building sustainable education research facilities. These projects utilize many green building elements, including: solar, wind and biodiesel energy systems, alternative building materials, living roofs, bio waste-water management, rainwater catchment systems and more. Travis also enjoys surfing, snowboarding, playing ultimate frisbee, sculpting, camping, and fly fishing, to name a few of his many interests . He is passionate about issues of justice, freedom, education and the environment. Travis describes his colleagues as unique in their talent, friendliness and integrity. He enjoys "the passion and drive that everyone [in the company] has to problem-solve and to practice responsible building." Tenere has a background in permaculture design, organic gardening and landscaping, passive solar design, and green building systems. With his multivarious talents he has worked in all aspects of residential remodeling including framing, finish carpentry, painting, electrical and lighting. His hobbies include longboard surfing, bicycling, and lightweight backpacking. He is fascinated with how things are made from design to fabrication, from form to function. Areas of greatest focus include: tools, appropriate technology, outdoor equipment, building materials, solar cookers and bicycles. But his greatest passion is for the life he shares with his wife of eleven years and their three year old son. Tenere enjoys working for NCCI due to the good feelings shared by all; builders, boss, and clients. He appreciates Nick's openness to hear everyone's ideas and the creativity that co-workers bring, but most of all he respects that "Nick is very supportive of our lives away from work and very understanding when family needs arise." 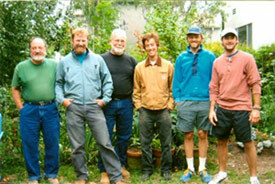 Win attended Northfield Mount Hermon School and Colorado College where he studied environmental science and marine biology. In addition to conventional residential construction he has worked on buildings made with alternative materials, and utilizing solar and wind power, gray water systems, living roofs and timber framing techniques. Win loves the outdoors and is passionate about sustainable building, community development, alternative energy, and ultimate frisbee. He says, "Respect is the quality I most enjoy about NCCI. I feel that my hard work and ideas are valued. Respect can also describe our interaction with clients and subcontractors. This contributes to a positive workspace in our client's homes." Loren attended Carmel High School and later Monterey Peninsula College. Before moving to Berkeley and joining our crew, he worked as a custom-home builder in Carmel for six years with a craftsman and green builder, followed by three years with Watson Batori Inc. Loren enjoys time with friends, sailing, kayaking, climbing, backpacking and great food. He has a passion for history and social issues. Loren is thankful to have found a local company with "green values" and appreciates working for a company that respects and focuses on caring for our clients and our world. Loren enjoys "practicing my craft with co-workers that share my ethics, values and passion for work and life, and being part of a close-knit family company." Annelise attended the University of California at Berkeley with a major in English and minors in Conservation and Resource Studies and Forestry. She was the Adult Programs Manager at Cal Adventures for two years and has worked for a variety of organizations and universities teaching sailing, kayaking, and facilitating outdoor education programs. After a year and a half racing 470 class sailboats, qualifying for the 2003 US Sailing Team and trying out for the 2004 Olympics, she returned to Berkeley and began working with Trader Joe's, and recently, at NCCI. Her hobbies include cooking, sailing, backpacking, climbing, yoga and reading. Annelise enjoys "feeling like part of a family, and part of a business that really cares about its clients and employees--and of course, about craftsmanship." While working in the office she is always accompanied by Gypsy (the household dog).